Have you ever seen a Juppy before? I know I hadn't seen one, but I wish I had this when my kids were small. 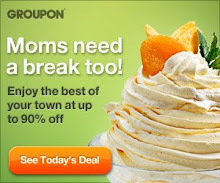 Remember how you became the hunch-back of toddler-ville? You have to stoop over for seemingly days on end to help give a 'grip' for your pre-walking child. What if you could safely help your child learn to walk and cruise around without the back ache and strain? Well, that's what a Juppy does!! The Juppy "Momentum" is a solution to a previously recognized but unsolved challenge for parents of babies beginning to walk. Babies strong enough to begin walking but not strong enough to walk alone. The Juppy builds confidence in your baby and teaches balance while you maintain your natural posture, eliminating the grueling task of hunching over while teaching your baby to walk. The Juppy has easily adjustable straps that accommodate your height whether you are 4'11" or 6'11". The Juppy comes standard with soft hand grips that are strategically placed to provide optimum benefit for your hands; a color matched state of the art zipper is located at the rear of The Juppy for the purpose of safety, easy access and exit. You will find two Velcro straps that overlap the back zipper which again shows our commitment to providing you the safest and most practical baby walker on the market. Unlike traditional baby walkers The Juppy is a parent assisted baby walker which eliminates all of the dangers of walkers with wheels. 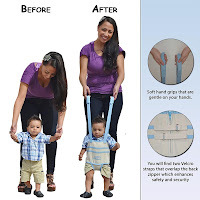 The unique design eliminates the problems associated with similar products for example other parent assisted walkers do not have the crotch piece which is essential in keeping your baby from involuntarily lifting its arms. 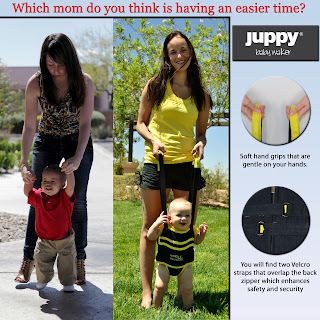 No more falling down stairs or reaching for dangerous objects because The Juppy requires your assistance at all times- One size fits all (baby weight not to exceed 35lbs). Made from 100% cotton that is machine washable. I was so excited to get mine. I have a friend who is having a baby and I got this for her shower. Since she doesn't know if she's having a girl or boy, I went with gender-neutral black for the Juppy. Also, since I didn't know the name, I chose to have Cruzin' embroidered on it. Everytime I see a Juppy in action, I'm humming the song "Cruising" so it seemed like the logical choice. We tried it out on another friend's son and it worked really well. We all agreed it was easy to use, easy to adjust for our adult heights and all of us had fun walking the little guy "B" around. 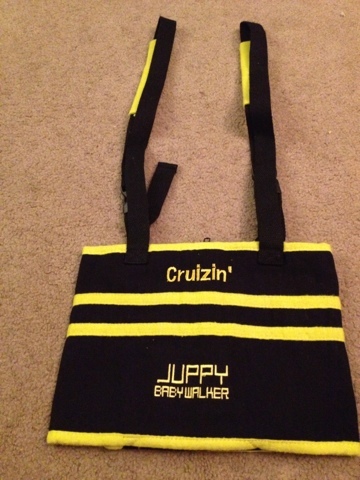 If you like The Juppy, be sure to check them out on Facebook and Twitter.